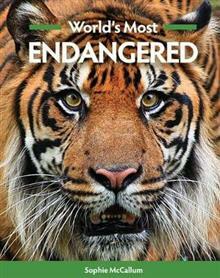 A new book that highlights the plight of critically endangered species, as classified by the WWF and IUCN. It focuses on 25 species of mammals, birds, reptiles and amphibians, presenting each account in an interesting and informative way, with colour photographs and a fact panel ... read full description below. 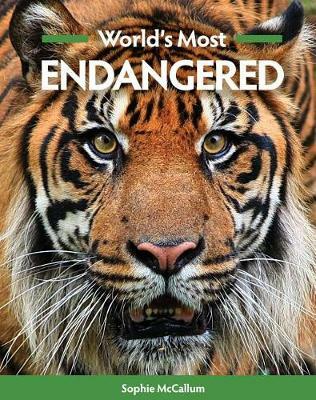 World's Most Endangered offers a fascinating facts and mind-blowing information on some of the world's rarest creatures. It focuses on 25 species of mammals, birds, reptiles and amphibians which are classified as Critically Endangered by the WWF and IUCN. Each account begins with stunning photographs and a fact panel giving key information, before providing detailed insight into the lives of these species, plus the threats they face and the conservation efforts being made to ensure their survival. Animals covered include causes celebres such as Sumatran Tiger, Mountain Gorilla, Pangolin, Leatherback Turtle and California Condor, together with lesser-known animals in peril like the Lemur Leaf Frog, Geometric Tortoise and Red Wolf. It gives an entertaining and engaging take on the subject, and is ideal for either reading right the way through or just dipping into a chapter at a time. Sophie McCallum is a lifelong advocate of conservation. She has spent time in Zimbabwe on projects concerned with the environment and community, has worked on scientific analysis of the River Tamar and she holds a BSc (Hons) in Environmental Studies and Creative Writing, as well as a qualification in Horticulture. Sophie has been working or volunteering with environmental organisations such as the Wildlife Trusts, the Eden Project, Natural England and BTCV for over two decades and she is always excited to educate others about the natural world.